Welcome to Day 3 of the Blog Hop for Catherine Pooler's latest release: Zen Garden! Today we're featuring Eat, Sleep, Create and the newest background stamp, Doodle Garden. This stamp set has the word 'create' in different fonts and lots of add-ons, so you can get lots of different looks. The word 'repeat' isn't included, but I created it by using 'eat', the 'ep' from sleep and the 'r' from more, for a fun addition to my sentiment. There is also a create die in the release - in a fun script-y font. And speaking of the add-on sentiments in this set, I just couldn't choose, so I used them all to create a 'grafitti-wall'. Finally, Doodle Garden - this design was on the wall at Creativation and we have all been dying to play with it since then! There are so many ways to use this doodly background and I know I'll be playing with this one for a long time! Here, I stamped it in Midnight and then partially inlaid the new Smile die, which I had blended with Polished ink. Beautiful cards, Ardyth thanks for sharing. I'm dying to play with the Doodle Garden too. Hope to order it soon. Love your cards. Awesome cards! You are very talented and I really love seeing your posts. Wow. Beautiful! Thanks for sharing! Your cards are AMAZING!!! This release rocks. Three very different style cards, each gorgeous and fun! Thank you, Ardyth, for great ideas for cards! I love how your indecision made such a beautiful second card. Keep up the good work. Thanks for sharing. Love the cards. You have done a wonderful job showing different options for using this release and Inks. Thank you. I really like how you created the background for your second card using the sentiments that are included in the stamp set. It’s stunning, thank you for sharing with us. Once again lovely, fun cards. These are really fun looking cards! Very nice! I'm reading all your blogs (with difficulty, I'm Italian, me and English are not friends) it's nice to see so many different ways of creating. I love your all word background. I honestly thought I missed a turnabout type stamp in this collection. Nicely done..
That doodle garden stamp is calling my name! So many ways to use it! I really like the graffiti card, very colorful! Love the look of your card with all of the colorful sentiments on it. These cards really show how many different things you can make with the stamps. Truly... create and repeat every day! Love your cards!! And I love the 'create' set. I love these cards. You have created great background and then highlighted them with the die cut words. I am especially fond of the Smile die cut. Thanks for sharing. Beautiful cards - love the new colors. Awesome cards! My favorite is the last one with the Doodled Background stamp!! Love it! I just love the paint splatters and the colors are perfect. These are great cards. SO much fun wrapped up in your cards! The colors are gorgeous. I love what you did with the "graffiti wall". WOW! WOW! and WOW!!! Great cards. Love all of them. So creative. I really have to case these. Pinterest for sure. Thank you for sharing. Love the cards and the way you showcased this product. Ardyth your cards are stunning. Thank you for sharing just how amazing this release is. Love how you used words to create the various backgrounds. Beautiful cards!! The repeated "create" on the background of the "Eat. Sleep. Create. Repeat" card is such a perfect way to accent the sentiment. I love it! Also, I'm really amazed at how bright even these more muted tones are. I can definitely feel myself falling in love with CP inks without ever having used them! Thanks so much for sharing your beautiful cards with us! Love the ink splatters. So freeing. fun and the last card is fabulous. Love the touch of red on the black/white. Your designs are shining examples of 5he versatilility of these wonderful stamp sets. Love the cards!!! The middle and last cards are my favorite. Great cards. Thank you for sharing!!! I just love Doodle Garden in black and white, stunning. Super cards! Thanks for sharing! Awesome cards! I can't wait to get mine to start playing and creating! Great cards! Love the inspiration you've shared! I like your creative, colorful and fun cards. Great cards! I especially love your grafitti wall and clever use of stamps for "repeat". Lovely cards, but I especially like the last one! Each and every day gets better and better! You ladies are oozing with talent! I only hope one day I can reach your level of awesomeness. 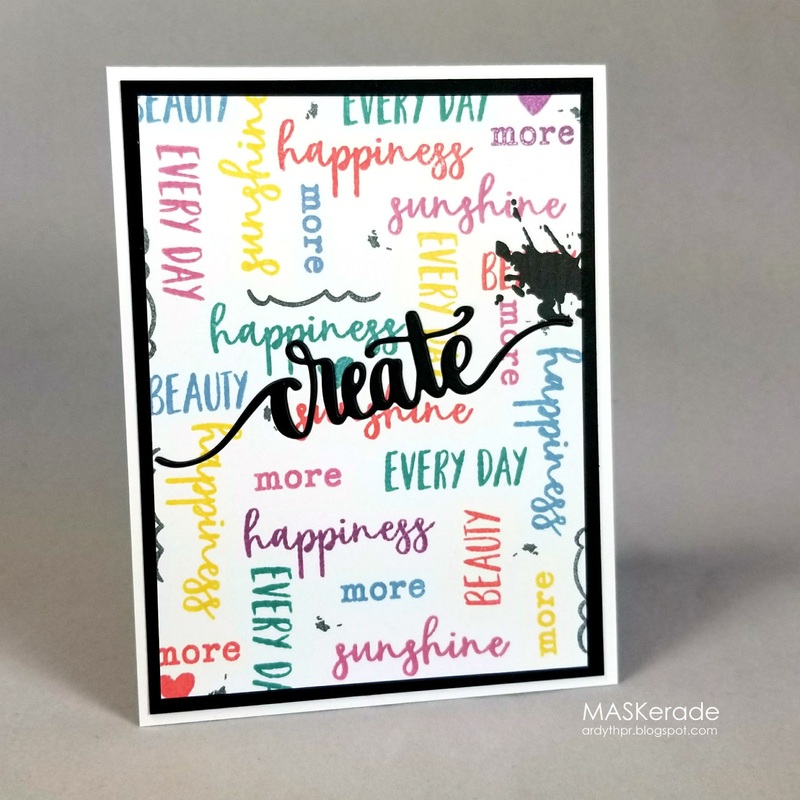 Your cards are wonderful - Love the Create card - The background really makes this card scream happiness! I really like all of your cards, but have to say the first one is my favourite. I Love those splatters & the ink colours in this release are my favourite so far. Love ur creative cards. The order for me would be, eat,create,slerp then repeat...lol. Love your cards so much Ardyth! The colors in this collection and all of Catherine Pooler's collections are so gorgeous looking! Thanks for sharing your cards! I always love what you make Ardyth and these are no exception - they're great! Beautiful, Ardyth. I'm liking Eat,sleep,create stamp set more each time I see it used. Beautiful cards. I like the Smile against the black and white of the rest of the card. Great cards! I love the word background on the second card. Thanks for sharing and inspiring! Pretty cards! Love the paint splatters! Great new colors! So gorgeous, love how you featured these beautiful products! Pretty cards. I love the Doodle Garden stamp. Great collection of cards you created! I love what you did with the doodle garden stamp! OMG And WOW!! I absolutely love and adore your cards!!! Truly amazing cards Ardyth!Love the inlaid smile/ doodle garden and the graffiti wall. Great ideas for using the stamps and dies. Thanks for sharing. WOWSA! I just can't even get over your use of these stamps and inks . . . amazingly "create"-ive! Love how you made the word "repeat" - clever! Beautiful cards. I have a die that cuts the sunshine word exactly like the one in this stamp set!! What a great assortment of card designs! Love the doodle background done in the black and white with just a pop of color! That’s a great bundle of cards ! I am in love with the ink splotch stamp! So cute and so many ways to use it! I love black and white cards with a pop of color. Very nice. 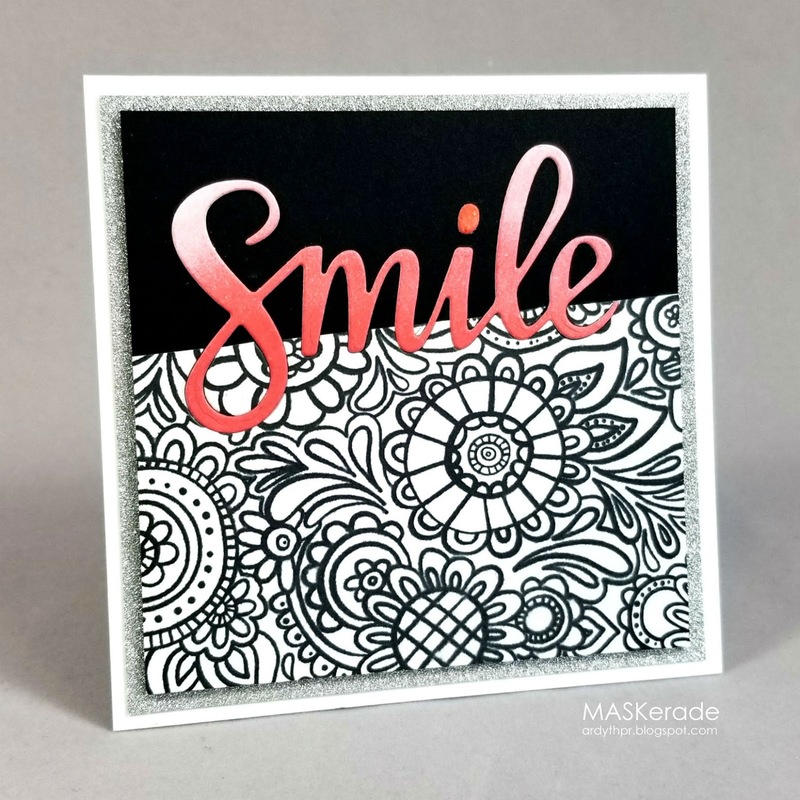 What awesome cards...love the gray base card and the the smile card with the black and white background. I can hardly wait formu stuff to arrive! Thanks for some inspiring cards. Really like the card with all the sentiments. Beautiful colors! Beautiful cards, well done . I like your colorful and creative cards. Nice cards Ardyth! I really like this collection! Fun, happy and elegant cards! Such a fun release. I just LOVE your CAS style! I really like the graffiti wall card. Great use of the set! Thanks for sharing with us. Great cards! I especially love the first one! Love the font for the stamped create and for the die cut create! Thanks for sharing your creativity with us! Fabulous designs. I love the classic look of the Smile card. So cool. Love these cards, Ardyth! They are so much fun and the sentiments really express the feelings of card-makers. Love the sentiment background on the die cut create card. How do you decide placement of the stamps to achieve such consistent spacing between sentiments? I absolutely LOVE that you made the word "repeat" from the existing stamps in the set. It finishes that sentiment on your first card sooooo perfectly. Love the graffiti-wall--no turn-about stamps used, either. I know from experience how careful you have to be with planning the colour and orientation of the words. Well done! Black and white and Polished! Love it! Fun cards, Ardyth. Love that last one. Great cards! I really like how you did the last one, it's so elegant in a fun way! Great cards. I love the creativity with the words and that doodle stamp is amazing! Thanks for the inspiration! Oh, this is probably the most beautiful collections i have seen ever! Me want! Lol. Really! This trio of cards is beautiful! I especially love the splats that show off these gorgeous new ink colors! !